Bosleys latest public auction took place on the 5th July at their Court Gardens saleroom in Marlow and began with a fine array of original military badges, these included a superb selection of no fewer than 39 British Army shoulder belt plates, the highest price in this section being a 39th (Dorsetshire) Regiment of Foot, Victorian Officer’s shoulder belt plate circa 1825-55. which sold for £2,600 other high prices were achieved for a 76th Regiment of Foot Victorian Officer’s shoulder belt plate £2,100 and a 37th (North Hampshire) Regiment Officer’s shoulder belt plate selling for £1,100. Remaining with the 37th Hampshire Regiment a rare Officer’s waist belt proved popular with a telephone and room bidder fighting to own the lot which hammered at £900. A rare Officer’s Bell Top Helmet plate for the 17th Foot Liecestershire Regiment fought off a postal bid to hammer at £1,300. 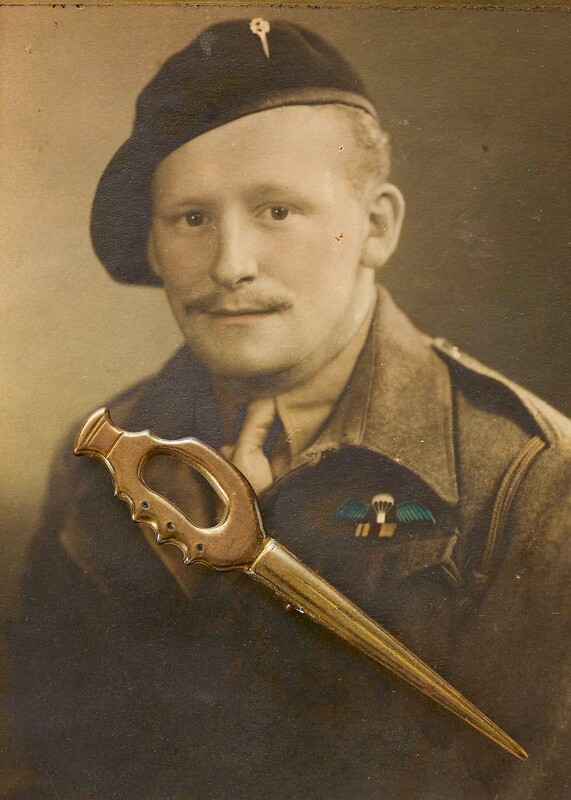 WW2 Special Forces remain popular with £800 being paid for a silver 1943 Hallmarked Officer’s Cap badge and a rare attributed Force 133 “Dagger” cap badge worn by Corporal J.B. Elliott hammered £2,400. This badge came with ephemera detailing Corporal Elliot’s clandestine operations in the Balkans and North Italy. The sale contained 39 lots of headdress and the highest price of the day was £8,000 paid for the magnificent Imperial Russian Czar’s Horse Guard Officer’s helmet. This was closely followed for an outstanding example of an Officers helmet for the Queen’s Own Glasgow Yeomanry which sold for £5,800. East Riding of Yorkshire Imperial Yeomanry Officer’s lance cap £2,200 and a very good example of the 1st or King’s Dragoon Guards OR’s 1834-43 Pattern Helmet £4,800. 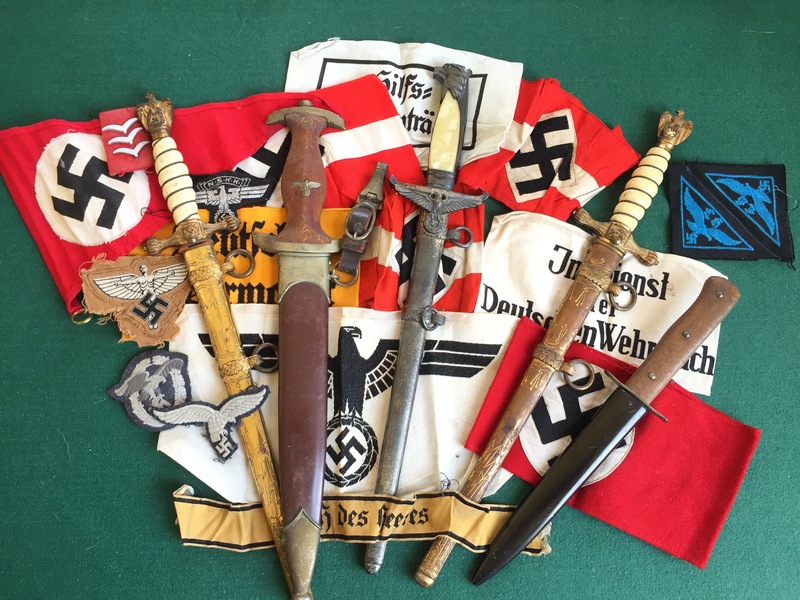 This sale contained one of largest selections of German material 160 lots including a number of WW2 Third Rich items, these included an Allgemeine-SS NCO’s peaked cap which sold for £2,400, a fine 1933 model SS mans dagger by Gottlieb Hammesfahr, Solingen-Foche selling for £2,000 and a similar chained example at £1,500. A SS 12 year Long Service Award sold for £1,300 and a four year award in original case sold for £650. amongst the hoard was a Government Official’s dagger by Eickhorn, Solingen circa 1939-42. Its provenance and sleepy untouched condition encouraged bidders to make the hammer fall at £2,400. Sergeant Savile could never imagined that his “Booty” would one day raise £5,700 for his family. The final section of the day was devoted to swords and edged weapons, although late in the day a strong crowd of bidders remained in the room and a number of keen bidders waited on the internet live bidding platform. From the beginning of the section it was clear that some very keen bidding would follow, highlights of the section were an 11th (Prince Albert’s Own) Hussars Victorian Officer’s Mameluke Hilted Sword by Wilkinson carried by Major Harold Stanley Cayzer this sold selling for £3,200. An Elizabeth II Life Guards Oficer’s State Sword in near parade condition selling for £2,400. Royal Navy Flag Officer’s 1827 Piped Back Bladed Sword hammered £900 and although one of the very last lots a rare pair of swords carried by an Officer of the 10th Hussars sold for £1,200. The main body of this section was devoted to a collection of French Napoleonic War period swords with a French Napoleonic Senior Officer’s Blue & Gilt Bladed sword leading the way with a price of £3,600 closley followed by Lot French 1811 Napoleonic War Period Light Cavalry Trooper’s Sword selling for £3,200. After close on eight hours of selling the last but no means least was Lot 879 British Army 1845 Pattern Officer’s Sword sold to a room bidder at just over the lower estimate at £240. Bosleys next Auction will be held on the 1st November.